Gold is an online slot by Big Time Gaming with 20 static paylines and available at online casinos supported by the NYX/NextGen Gaming platform. Stimulating and glittering objects in gold motif, from Gold Bars, to a gold-painted Car, gold-cast Ring, gold-tone Wristwatch, and gold-made Card, appear as assortment of 3-tiered reel elements set in a five (5)-column golden grid. Since opulence is the theme, slot players can expect the same lavishness from the game's special features. The Wild Symbol pays 2x on all Wild-completed wins. Expect more once the game enters the 3x-paying free round, as Wild wins consequentially increase to 6x the prize value. The 2x Multiplier though applies only to standard Wild-completed wins. A Golden Briefcase represents the Wild icon. It pays double on payline wins that made use of its substitution functionality. Same-symbol images, including the lesser paying yet lavishly presented A, K, Q, J and 10 characters, can use the Golden Briefcase Wild as alternative image to complete a win pattern. Wild-completed wins are evaluated based on the corresponding payouts of the winning symbol. Yet if the Golden Briefcase Wild itself lands in 2s, 3s, 4s, or 5s along any payline/s, the game correspondingly pays as many as 10, 200, 2000, or 10000 coin credits. The pay-scheme for Wild Combos though remains standard and only the highest grouping per payline earns the related coin wins multiplied by the value staked per line. Big Time Gaming's BTG logo set in a Gold Disc and labeled as Scatter, poses as Bonus Game trigger symbol. The Golden Disc comes into view in any column or tier, and could loosely form a triggering combination by simply emerging as a group of 3 or more, even if not adhering to a pay pattern. Additionally, a set of three, four, or five Golden Disc icons, also earns Gold players 2, 5, 20, or 100 coin credits multiplied by the current Total Bet. A Scatter Reward though is based on the longest Scatter grouping achieved thru each spin. Once activated, the game sets in motion fifteen (15) Free Games running on a different set of reels. Here, a 3x Multiplier apply to all bonus wins including Scatter Rewards and winning Wild combinations. 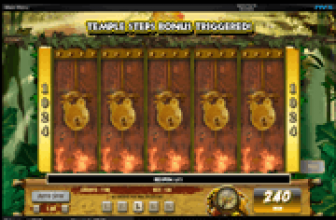 However, this Gold slot game excludes the 5-symbol Wild Combo from the triple-pay bonus scheme. 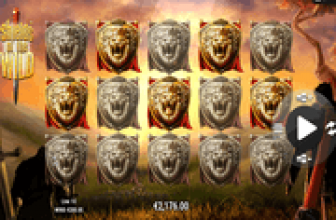 During the round, and when another set of 3 or more Golden Disc Scatter icons emerge as outcomes of a single bonus-spin, a fresh batch 15 free games will be added. The Betting Options offered by this game covers all 20 paylines. The amounts furnished as choices are already stated as Total Bets, ranging from 0.20 to 500.00. To determine the bet value wagered on each payline, simply divide the Total Bet over 20 paylines. A Minimum Bet per spin of 0.20 therefore is equivalent to a 0.01 bet per line, while a 500.00 Max Bet equates to a 25.00 stake per line. Gold : Exciting Bonus Game that Triples all Bonus Wins Including 2x Wild-Wins! Gold is a Big Time Gaming online slot enriched with a double-paying Wild and a round of free games that pays triple on all Bonus Wins, including Scatter Pays and Wild-completed Wins. Winning Wild Combos occurring in the Bonus Round, except the 5-of-a-kind grouping, likewise earn triple pay!